Do you feel like your eyes have aged? Some bad habits can make your eyes appear more aged than they are. The best way to preserve your eye health and appearance is to cut these bad habits out of your life!bits out of your life! There are tiny blood vessels under their skin around your eyes, excessive rubbing can cause these vessels to break. As a result, you may notice dark circles, puffy eyes, premature crows feet, and drooping eyelids. We recommend you refrain from pulling or tugging this skin because it is very sensitive. If your eyes are irritated, place a damp cloth on them instead of rubbing. Protecting your eyes from the harmful UV rays of the sun helps your eyes to stay healthy and young. If you don’t wear sunglasses, you could damage the eyes or sunburn the eyelids. Additionally, you increase your risk for eye diseases such as cataracts, macular degeneration, pinguecula, and pterygium. To keep your eyes healthy, youthful, and safe wear sunglasses that block 100% of UV rays. Smoking is linked to eye diseases such as cataracts, macular degeneration, uveitis, dry eye, and diabetic retinopathy. This is a bad habit that drastically ages your eyes. Smokers are four times more likely to go blind than nonsmokers. Quitting smoking, no matter what your age, reduces your risk of developing severe eye conditions. Your eyes can appear aged if you don’t get enough sleep. Consequently, a lack of sleep can cause red bloodshot eyes, dark circles under the eyes, eye twitching, dry eyes, and blurry vision. Not sleeping is a bad habit for your overall health and wellbeing. Not drinking water can make you dehydrated. When you are dehydrated your eyes do not produce enough tears. As a result, you may experience symptoms of dry eye. The last bad habit you need to change is not visiting your eye doctor. Many eye diseases can go undetected and cause harm before you are even aware of changes in your vision. Some eye diseases have no warning signs and can cause irreversible vision loss. Regular visits to your eye doctor are the best way to protect the health of your eyes, detect vision problems, and find possible eye disease. Don’t forget to inform us of any family history that can help to protect the health of your eyes. 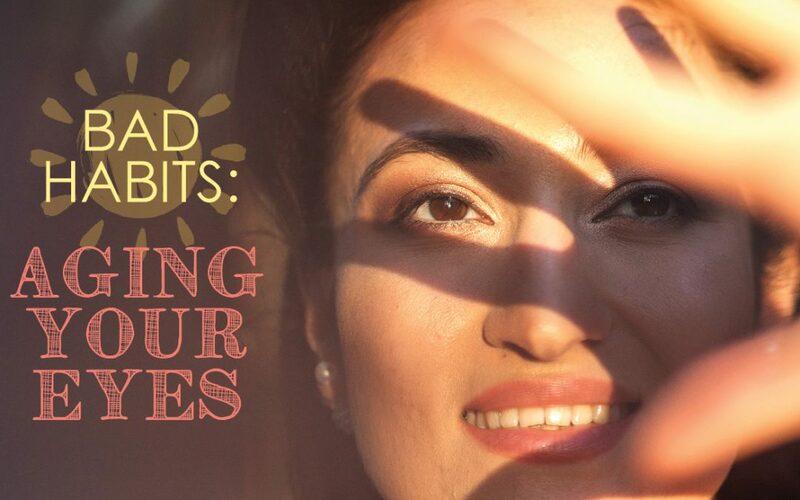 Eliminating these bad habits from your life can help to improve eye health and maintain a youthful appearance. Give us a call today to schedule your regular eye exam.